After an unexpected death shatters her family, Victoria retreats into the darkest recesses of her psyche in search of a way forward. To find meaning in an impossible loss, she brings a terrible creation to life - one whose existence threatens all hopes for the future. Haunted and hunted at every turn, Victoria must endure a nightmare journey of the soul in a quest for survival. Grapple with the demons of grief and denial in this world premiere adaptation of the 1818 thriller by Mary Wollstonecraft Shelley. "...Sonneville�s performance meshes beautifully with Kauzlaric�s thoughtful (if at times a tad mannered) adaptation � emotionally engaging without falling into rote histrionics. The truthfulness of her Victoria�s journey through the stages of grief recasts one of the most well-known monster fables into an authentic and sometimes profound portrait of monstrous loss"
"...Still, there is much to recommend "Frankenstein." For one, there's that monster. With Hainsworth manipulating Von Orthal's creation, the birth of the creature doesn't need cheesy lightning bolts to heighten the drama. As in the novel, Victoria's unholy creation is burdened with unbearable loneliness, an unhappiness so intense it leads to savagery. Lifeline's monster literally engulfs his victims, pulling them up from the grave and enfolding them into the flickering heart of his being. In the end, the puppet contains half a dozen victims, creating a visual that evokes the multi-armed powers of Shiva the Destroyer." "...In other words, Victoria's creature is meant to be seen as nothing more than a metaphorical construct�"a walking, talking personification of Grief"�and the havoc it causes is so much psychic rage against the dying of Dad's light. And where Shelley's Frankenstein is involved in a truly cosmic struggle with the living being he created at the peril of his eternal soul, and with whom he can never be reconciled, culminating in a death race across the most barren stretches of the earth, Victoria just needs to get her head on straight." "...Embodying this metaphor is Cynthia Von Orthal's towering rod-puppet Lazarus whose countenance reflects a myriad of expressions and whose multiple-operated limbs facilitate a dexterity allowing him, at one point, to physically overpower his distraught reanimator, portrayed with steely resolve by Ann Sonneville. Oh, and since an uneasy mind often resembles a mad scientist's laboratory, a virtuoso tech team supplies a kaleidoscope of hissing lights, eerie music and evocative shadows." "...But theater is not merely a visual art form and the substance of this �Frankenstein� is sadly lacking. The performances often feel wooden, as if the actors are exhausted or otherwise not fully invested. One can hardly blame them, as the script gives them very little to work with. Written partly as a method of processing the playwright�s own grief, this adaptation is closer to �Babadook� than �Frankenstein,� despite hitting most of the major plot points of novel." "...Lifeline has a spellbinding new hit on its hands. This intriguing, original, feminist retelling of Mary Shelley's horror classic is presented without an intermission, so as not to break the story's suspenseful mood. Dynamically directed and artistically elevated by a talented technical support team, this production captivates. Much credit goes to Cynthia Von Orthal for her frighteningly lifelike puppet that represents Frankenstein's monster. Joe Schermoly's haunted house-inspired scenic design, embellished by Jordan Kardasz's eerie lighting effects and Barry Bennett's dramatic original music and sound design all add up to the perfect Halloween treat." 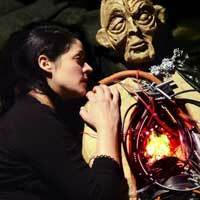 "...Lifeline�s FRANKENSTEIN is an elegant adaptation of a traditionally creepy story. Sonneville beautifully tethers us to her grieving process. We watch as she grapples with immortality and morality. Although I recommend this show, I�d warn folks that this isn�t a Halloween fright night of blood and guts. It�s more tender, than terror. And special nod out to Kauzlaric for best last line in a play." "...Director Paul S. Holmquist draws out excellent portrayals from all of the actors tasked with bringing this harrowing tale to life: Risha Tenae as Victoria�s bereft mother, Ty Carter as her would-be husband Erich (Elizabeth in the original story), Rasika Ranganathan as her best friend Helena (Henry in Shelley�s novel), Emily Ayre as the horribly doomed Justine, and Trent Davis as Victoria�s young brother William. Each of them also portrays the demon spirits haunting Victoria as she first seeks to build the creature and then seeks to escape it." "...At the center of Kauzlaric�s searing study of the narrow divide between grief and fear is the brilliant and gripping narrative performance of Ann Sonneville in the role of Victoria. Alternating between melancholy and denial over the death of her father, Victoria resurrects his spirit and the Creature is born, poised for more rage, havoc and pain throughout this fast-paced and compelling thriller." "...Lifeline Theatre�s world premiere adaptation of Frankenstein reimagines Mary Shelley�s quintessential novel as the story of Victoria Frankenstein (Ann Sonneville), a university student who has just suffered the unexpected death of her beloved father Alphonse (Chris Hainsworth). As her family mourns and begins the slow, painful process of accepting his passing, she decides that if they are resigned to such �weakness,� she must be strong. It would take a miracle to bring her father back, so she determines to make one."